This week Pippins class have been looking at the colour green. They have collaged some green frogs, used their hands to create 5 speckled frogs and had fun printing with apples. Acorns class have also been looking at the colour green along with the shape of a triangle. They have collaged some funny looking green alien men and used triangle sponges to make wiggly caterpillars. They also enjoyed some sensory play in the cold jelly! 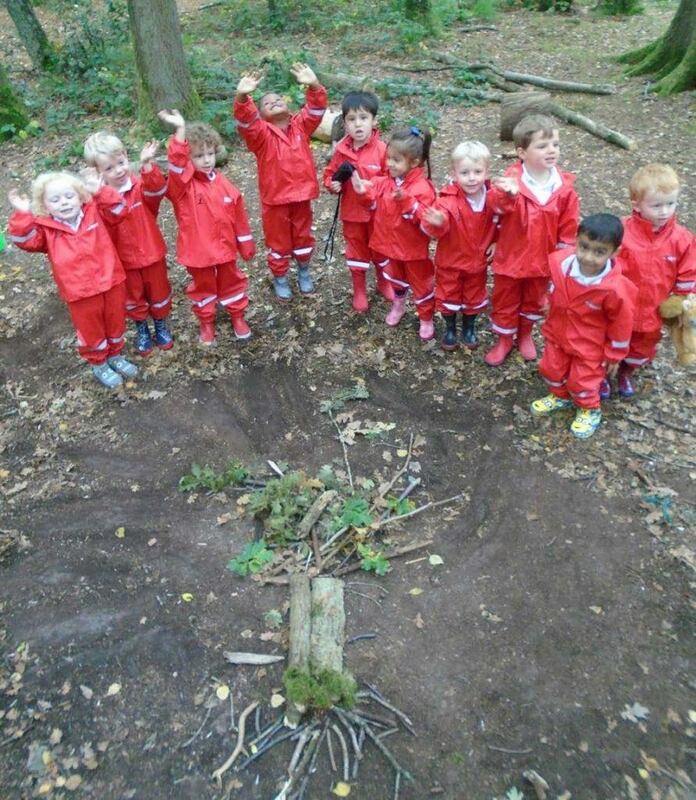 In the woods this week they collected acorns and made some little hedgehog dens, they then squashed some brown clay in their hands and shaped them into hedgehogs, found acorns for their eyes and little sticks to be the prickles on their backs. Oaks class have been learning about vets this week and how they help the animals. They were very lucky to have a visit from lovely vet, Mrs Christopherson and her gorgeous dog Betty. She told the children how to look after their animals, keep them clean and brush them well. They all tried on the operating masks and gowns and listened to Betty’s heartbeat as well as looking at a model of a cat and dogs jaw. They also made a bar chart of the pets in the class, collaged some shiny scaled fish and have turned the role play area into a veterinary surgery. This week in the woods they collected a variety of different seeds and then made a little tree using the different seeds.